2017 Whitetail Report: How Are The Deer Doing? I recently returned from the 2017 North American Deer Summit, a two-day event where the top deer biologists and scientists in the nation gather to discuss the health of our herds and the future of hunting. First on the agenda: How are whitetail deer doing across the U.S.? QDMA biologist Kip Adams kicked off the discussion with some good news. After several tough years (2011-2014) when winters were harsh in some regions and big outbreaks of EHD killed substantial numbers of deer in other areas, things are looking up for America’s most popular and widespread game animal. Kip pointed out that the buck harvest is up 4% (hunters in America shoot some 2.7 million bucks every fall). 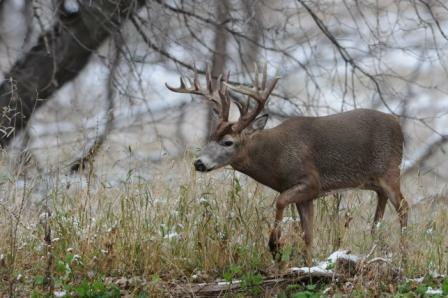 Furthermore, the percentage of bucks 3.5 years of older in the harvest has never been higher. It took a while but hunters as a whole have finally embraced the idea of letting small bucks walk in hopes that they will the opportunity to shoot a mature, big-racked deer next season or the next. “I’ve been monitoring this issue for many years, and hunters’ attitudes on letting young bucks grow have definitely changed,” said Kip. Also, 10-15 years ago, if a state wanted to implement antler restrictions in order to save immature bucks, hunters would scream. Today, more hunters than ever, a strong majority, support antler restrictions that let 1- and 2-year-old bucks walk and grow. But there are threats to deer herds and deer hunting, including predators and lack of access to good land for hunting. But it all pales to the spread of Chronic Wasting Disease. CWD, which has now been documented in more than 20 states, is a contagious neurological disease that affects deer. It causes a spongy degeneration of the brains of infected animals resulting in emaciation, abnormal behavior (drooling and stumbling), loss of bodily functions and ultimately death. A large portion of the 2-day deer summit was devoted to the CWD threat, and I’ll cover that more in future blogs. But here’s the most disturbing thing. Consider that CWD has been documented in both mule deer and whitetails in Wyoming for at least 40 years. For those 4 decades the deer herds survived and grew in many locations, causing some people to be skeptical of the CWD threat. Consider me one of those early skeptics. I have hunted in Wyoming many times, and on every hunt, I have been amazed at the number of deer I have seen. Some of the strongest herds in America. How could there be so many deer out here if CWD is such a big deal? Studies from CWD-prevalent areas in Wyoming the last couple of years have shown noticeable drops in deer numbers, perhaps 18% in places. This is the first time that CWD has been directly linked to population declines. The big worry as CWD spreads across the country: Once herds are infected with CWD, maybe it takes several decades for substantial numbers of deer to start dying and populations to diminish? There are still many questions and a lot to be studied and learned about CWD, but Kip Adams and all the other scientists at the summit echoed the same sentiment: CWD is the biggest threat to deer and deer hunting in 2017 and maybe ever. All hunters must get engaged on this issue and be informed. This entry was posted in Big Bucks, Big Deer TV, BigDeer, Deer Management, Deer Science, Hanback, whitetail deer by admin. Bookmark the permalink. Interesting, and a good outlook aside from CWD. I wasn’t aware it is in 20 states now. Not ideal.